Continuous ion exchange units by Calgon Carbon separate, recover, purify, and synthesize a host of materials, including high-fructose corn sugar. 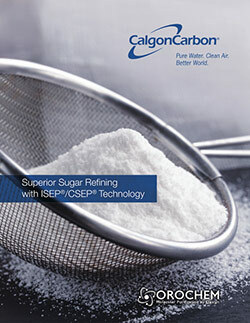 Calgon Carbon Corporation is a world leader in offering sugar decolorization and deashing technologies based on ion exchange. CCC can bundle the performance advantages of activated carbon with equipment (service or purchase) and related services, to provide a full turnkey solution for sweetener applications. Many times the equipment will be customized to fit the requirements of the application and customer site requirements.